When you plan the decor in your Springs Apartments home, does your attention go much below eye level? Area rugs are a stylish way to add comfort and warmth while defining different areas. Use these helpful guidelines to solve tricky issues including size, shape and placement. The bathroom is a place for smaller rugs that can double as bath mats. When you place an area rug in a living room, bedroom or dining area, it should be the focal point that anchors the entire space. 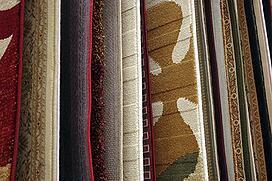 A handy rule of thumb is to select a rug two feet shorter than the shortest wall in the room. In a dining area, the rug should be large enough to encompass the furniture and extend far enough beyond the seating to avoid catching a chair leg when moving away from the table. For the living room, choose one that extends underneath the front set of couch and chair legs. This tricks the eye into seeing the rug run indefinitely, making the space appear larger. A bedroom area rug should be placed under the bottom two-thirds of the bed at right angles, allowing sufficient room for you to be able to place your feet on it when getting up in the morning. If you're using an area rug to create a space like a reading nook or office, it should be large enough to accommodate all the corresponding furniture pieces. Don't be afraid of patterns, even if you already have other patterned pieces. Just make sure the patterns are different sizes so they complement each other rather than fight for attention. If the rug has a central design or asymmetric pattern, be careful that the main features are not covered up by furniture. It's easy to get caught up in thoughts of size, shape and color or pattern while overlooking the matter of texture. Contrasting textures add depth and interest to a room. For instance, if your living room furniture is upholstered in soft fabrics, an area rug in a natural fiber such as sisal or jute would be a good choice. You're not restricted to a single area rug. Maybe you have an area where two rugs would be better. Layering is another attractive option. Try a round rug on a rectangular one, or use a second rectangular rug placed at an angle. Do you have any creative tips for decorating your apartment home with area rugs? Share them in the comments!